Spring, Conroe, Magnolia, The Woodlands — what’s the difference? These parts of Houston have the potential to confuse residents because they’re all in the same general area. And on top of that, some of the zip codes overlap. It can be hard to know where one area ends and another begins. Fortunately, we are Woodlands zip code experts, and we are here to help bring clarity. 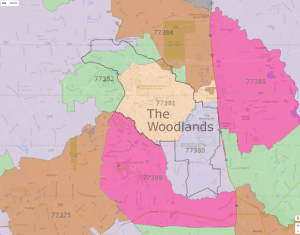 Read on for some insights on each of The Woodlands-area zip codes. You’ll find The Woodlands nestled 28 miles north of Houston along Interstate 45. This master-planned community can be difficult to navigate because signage and buildings are unobtrusive and shadowed by surrounding forest. Within The Woodlands are eight zip codes. Here are the zips and some information on their respective areas. Only 28% of households here have children. Almost half the population rents. Homes here are expensive — median home value is $277,800. This is a nicer part of town, with an affluent population. Most homes in this area were built in the 2000s and are very expensive compared to surrounding areas. Available apartments are mostly 3+ bedrooms. This area overlaps into the city of Conroe. Gender is split nearly 50/50. Many families live in this area, with a small number of single adults. The majority of residents are homeowners. The median home value here is $206,600, making it a reasonably affordable place to live. Most people have a commute time of over 45 minutes. 77375 borders Tomball, while 77389 is closer to the community of Klein. 2 and 3 bedroom apartments are available, starting at $750 in 77375. Almost 20% of children in 77389 attend private school. Conroe — the seat of Montgomery County — is 40 miles north of Houston, along Interstate 45 past The Woodlands. 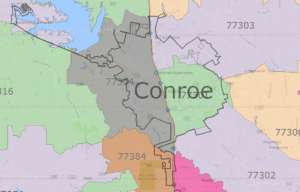 Although most people associate Conroe with its main zip code of 77301, it’s actually home to 10 different codes. Spring is not a city, but rather a CDC (census-designated place). The community straddles both Harris and Montgomery counties, while Old Town Spring is located where Spring-Cypress Rd meets the Hardy Toll Rd. It is 9 miles west of The Woodlands, and 25 miles from Houston. Of all the locations listed, Magnolia is the most rural. From Interstate 45, FM 1488 connects Magnolia just between Conroe and The Woodlands — making it a 44-mile drive from Houston. The city is poised for growth, with major corporations moving in. And the construction of the SH 249 Toll Road means you should always be prepared for detours. 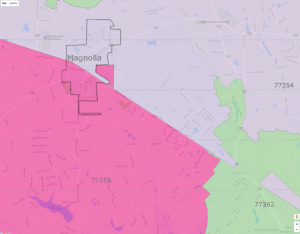 Only three zip codes lie within the city of Magnolia, making the area fairly simple to navigate. Are you considering a move to The Woodlands or somewhere nearby? Choose a dependable moving company like Ameritex Movers. We’re local, trustworthy, and passionate about moving. Ameritex is here to help you get from A to B smoothly and stress-free. We know every zip code in the area and can guide you through your move. Whatever your moving needs, we have the services and flexibility to get it done right and on time. Contact us today! Call our office at 713.484.6683 and we’ll happily answer any questions you may have. Or, fill out the easy form at the top of the page for a free moving estimate.